Scottish author Robert Louis Stevenson is known for his novels such as Treasure Island and Kidnapped. Because of he was often ill, Stevenson traveled around the world in search of a location that would improve his health. He wrote about his travels. 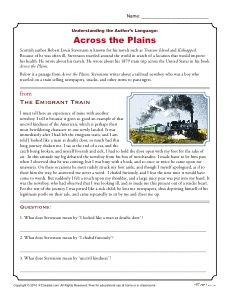 He wrote about his 1879 train trip across the United States in his book Across the Plains. Print out this free worksheet for your students to learn how authors use words to convey a specific meaning.